Sunburn. Ouch! Who wants to spend vacation with skin that feels like it’s on fire? So, my first suggestion is NOT to get sunburned in the first place. If you’re not from a southern climate that gets strong rays from the sun all year long, like that found in Tulum, you might need to learn to RESPECT THE SUN. It can catch up on you very quickly. To best avoid sunburn, sightsee early in the morning or in the evening. This is easy when you are conveniently located just a few miles away at Posada Yum Kin. Our guests say that our location, so close to many of the best sights in Riviera Maya, is one of the things they like most about our Tulum hotel. Also, be sure to wear a hat and bring extra sunscreen that is not more than one year old. If you are visiting one of our many local Mayan ruins consider wearing a long sleeved, lightweight shirt . Okay, enough with the ‘prevention is worth a pound of cure’ philosophy. Most everyone will get sunburned from time to time. If you experience symptoms of chest pain, nausea, vomiting, flu or chills you should consult with a doctor. 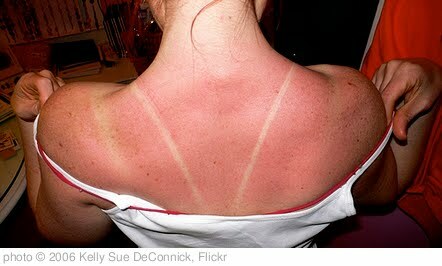 Untreated very severe sunburn can even result in death. Medications such as aspirin, ibuprofen, and naproxen are useful, especially when started early. If you become sunburned, do not put on any type of cream without cooling yourself down first or you will ’lock in’ the heat lying under your skin. To cool down your skin, use cool compresses, stretch out in cold water in a tub, or stand under a cold shower for 5-10 minutes. Obviously, using a tub or shower is best; cooling the ‘core’ of your body helps restore your body’s defenses. But don’t stay in so long that your skin becomes waterlogged or that will promote over-dry skin. To alleviate the pain, prepare a solution of one-part vinegar and two-parts cold water. It’s also been suggested that equal parts of milk and water work as well. Either put in a spray bottle or apply gently with a soft cloth or sponge to all of your sunburned body parts. Let it air dry on your skin. Don’t worry, the smell goes away in about an hour or so. You can perform this treatment two or three times per day until your skin feels better. Do not rub with a towel or shave your skin at this point. After your skin is dry, apply Aloe Vera. Directly from the plant is best, but if you don’t have a nearby Aloe Vera plant, like we do at Posada Yum Kin, then use a purchased gel that does not contain alcohol. Apply periodically throughout the day. Keep away from putting lotions or creams containing alcohol on your sunburn because they tend to dry out skin. Heavy creams can also lock the heat into your skin. Avoid perfumes and body washes that have scents as many of these contain alcohol as well. Find an after sun lotion that does not contain alcohol and hopefully contains a combination of Aloe Vera, vitamin E and shea butter. Apply it liberally and frequently until your skin feels moist and the pain has gone away. Applying after sun lotion will help keep your skin from peeling and may allow you to keep that tan a few weeks longer. The remedies described above are personal suggestions, if the burn is extensive, you should consult your doctor immediately to avoid further complication.